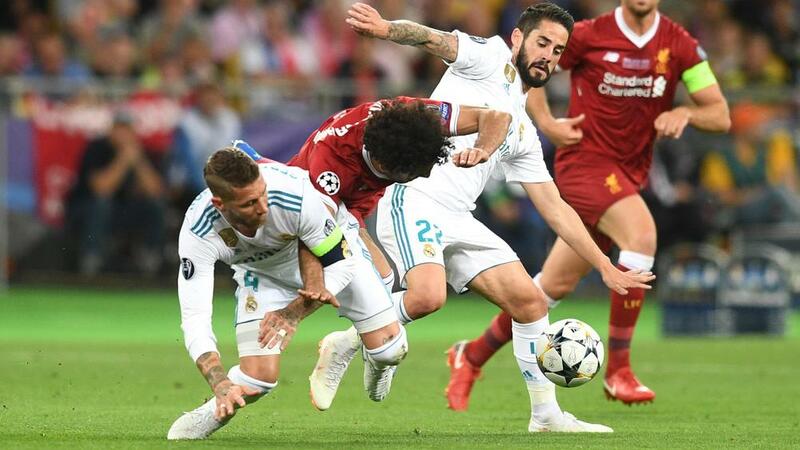 Liverpool manager Jurgen Klopp compared Sergio Ramos' challenge on Mohamed Salah in the Champions League final to wrestling. Salah came off in tears half an hour into Liverpool's 3-1 loss to Real Madrid in Kiev on Saturday after hurting his shoulder under a challenge from Ramos. Klopp was unhappy with the tangle, which the Egyptian Football Association said had left Salah with ligament damage in his shoulder. "Congratulations to Real Madrid, [it's] not to forget they won the Champions League. Of course it was a big moment in the game," the German told a news conference. "I know if you say something like that after a game you lost, it sounds like you are a little bit a bad loser but it was, for me, kind of a harsh challenge. "It's like wrestling a little bit and it's unlucky then that Mo fell on his shoulder." Liverpool had made a bright start to the encounter, but Madrid took over after Salah came off, with Gareth Bale's brace – after Sadio Mane had cancelled out Karim Benzema's opener – the difference. Klopp acknowledged the Egypt international's injury had allowed Madrid to take control, while he lamented the way his team conceded as goalkeeper Loris Karius endured a nightmare outing. "The shock of the boys was obvious, we dropped a little bit deep and Real tried to use that for positive momentum, until we settled a little bit," he said. "It was quite difficult but 0-0 at half-time, we could adjust a few things – defending half-spaces, which we did before that really well, and then playing more football. "And then the other decisive moments were the goals; they were quite strange, that's how it is. "We all know the result is 3-1 Real Madrid and that's why we are not in the best mood obviously."